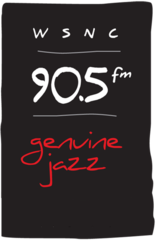 WSNC-FM is a 10,000-watt public Jazz and NPR radio station located on the campus of Winston-Salem State University. WSNC-FM broadcasts 24 hours per day, 7 days per week. WSNC music programming consists of more than 100 hours of Jazz each week, and 48 hours of specialty programs such as Gospel, Blues, Oldies, Reggae, World and Latin music. WSNC programs more than 40 hours of NPR news updates. WSNC programs and produces more than 20 hours of local, state, and national public affairs, news, information and infotainment programs. WSNC?s signal covers the following counties: Forsyth, Stokes, Yadkin, Davidson, Randolph, and parts of Guilford counties. 80% of WSNC listeners have two or more years of college.